December is a fun month, because I get to break out my Christmas muffin tin supplies, which don't get much use the rest of the year. Pierce had a hard time going back to school after the 5 day Thanksgiving holiday break, so I decided to make his day easier by doing a special bento lunch. And since it included one of our star muffin cups, I decided it could double as a Muffin Tin Monday post. He had a star full of kiwi slices, a snowman skewer of olives, a couple of yuletide logs (one being a celery stick filled w/ peanut butter and green/red m+ms, one being a Slim Jim), a cheese Christmas tree sandwich (I used a straw to poke holes in pepperoni to make the balls for the tree, and the star is also cheese), and packages under the tree - Cheeze-its with ribbons drawn on them using my Food Writers, Rice Cracker treats, and a couple of Teddy Grahams. For more fun lunch for kids ideas, go visit Muffin Tin Mom. My giveaway for Eco Natural Soaps is running through noon today. You can enter here! This is adorble! Love the tree. Adorable and so creative & healthy! Love it! This is so cute! I love the tree, the log, the whole concept. JDaniel had trouble going back to preschool too. I agree with many of the other comments... love the try! Cool idea to use a straw to make the pepperoni ornaments... my kids would love that! Cutest lunch ever!!!!!!! How creative! Love this! I think this is your best one yet. Your creativity never ceases to amaze me! How festive his lunch looks. I love the tree, so cute. Where in the world do you find the time to do all this? Cute! I'm sure his cute lunch will help make his day easier! I love the celery stick with m & m's! Love it! Great idea to make the Cheez Its into presents. Such a festive meal! I love this!! great ideas! Very cute, love the Christmas tree. These are adorable. 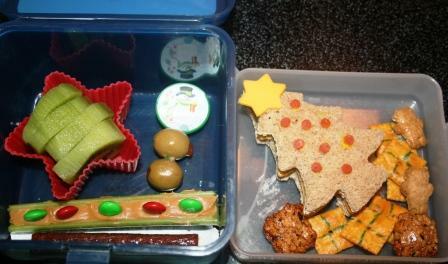 Bento has a facebook page - and there are tons of little tins and gadgets to help make lunches look more appealing. Great idea's and lots of different types of packed lunches, which is helpful because I always tend to get in a rut and make the same things over and over for the kids. Aw, this is absolutely adorable! And I'm sure that it's yummy. :) The Christmas tree is my favorite part of this cute lunch! You out did yourself on this one Lisa! It's just so cute I could eat it! hee haw! What fun! I could so go for the celery logs about now. I especially like the Christmas tree - very creative! I used to have fun with the goodies when my kids were small. One year we went through 40 pounds of just white sugar.I took plates of stuff all over. I never even thought of that! We haven't had any long breaks since DEaglan started school. I wonder if he'll be the same as Pierce after Christmas break. Love the Christmas muffin tins! Very creative! Any one of my kiddos would be delighted to find such lunch treasures!! What a cute bunch of ideas for meals!! I am the proud Momma of three little country boys myself... 3 year old twins and a 9 month old boy...I will definitely be following you so that I can get more ideas!!! I love this. I've seen bento box lunch ideas but haven't tried it yet. You're so creative! I love, love, love that!!! You are so creative!!!! I still remember that Christmas tree pizza you posted about last year...my kids loved that!! The little gifts under the tree are such a great idea. I'm totally gonna make that for Cole and Bella's school lunch this week! What a cute idea! I love the Christmas tree with the presents. I'll bet all the other kids enjoyed checking out his lunch! That's about the cutest lunch I think I've seen. Love it! that tree is so fabulous! So cute! I'm going to have to duplicate the tree for Dylan! These are awesome!! Love the m&m's in celery, Kaylin would LOVE those!